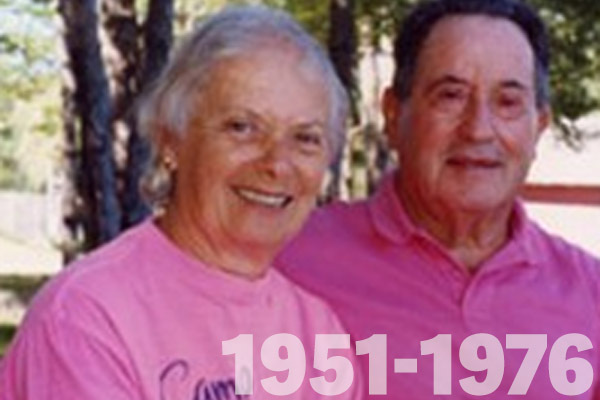 Three years after co-founding Camp Manitou for Boys in 1947, Joseph Nathanson and his wife "Midge" founded Camp Matoaka for Girls in Smithfield, Maine. They served as Directors, Caretakers, and Counselors to hundreds of girls who attended each summer. Uncle Joe and Aunt Midge, as they were affectionately known by all, built Camp Matoaka from a sheep farm. Born in Millis, Massachusetts, Uncle Joe was one of nine children who helped his parents run “Nathanson’s Hotel.” Upon graduation from Cushing Academy, Uncle Joe went to The University of New Hampshire on a football scholarship. He became Captain of the baseball team his senior year and was the fifth highest college scorer in the United States. After graduation from UNH, he turned down an offer to sign with the Red Sox and chose a career in teaching and coaching while playing semi-pro football for the Portland Sagamores. In 1942, Uncle Joe played baseball for the Army’s Algiers Baseball League and served as a Captain in the U.S. Army’s 13th Anti-Aircraft Artillery Gun Battalion in the Battle of the Bulge. After the war, Joe accepted a position teaching math and coaching football in Wayland, Massachusetts. Within a few years, he accepted a position teaching math at Weeks Junior High School in Newton, Massachusetts. Uncle Joe later received a scholarship from the Newton Public Schools to Harvard University where he received a graduate degree in Administration. He then became a principal at Newton South High School where he remained for 35 years until his retirement. Sadly, Uncle Joe died on Friday, July 17th, 1998; he was 85 years of age. Aunt Midge met Uncle Joe during World War II through her job with Jordan Marsh Department Store. While serving as Mom to her three children, Susan, Michael, and Peter, Aunt Midge was also Director, Office Manager, Dietician, Confidant, and Counselor to the girls at Matoaka. She could be found substituting in the kitchen for an ailing chef or working alongside carpenters, driving in nails for a much-needed bunk bed. She had a deep sensitivity for all children and treated her responsibilities with great compassion and dignity. Her philosophy for helping first -time and homesick campers formed the foundation of Camp Matoaka’s success in the camping industry. Aunt Midge passed away of Alzheimer’s disease in January 2002 in Hollywood, Florida. She was 82. Paula and Michael Nathanson—both originally from Newton, Massachusetts—brought a special sense of tradition to Camp Matoaka. Mike was the second generation owner and operator of Matoaka, and spent every summer of his life on East Pond. 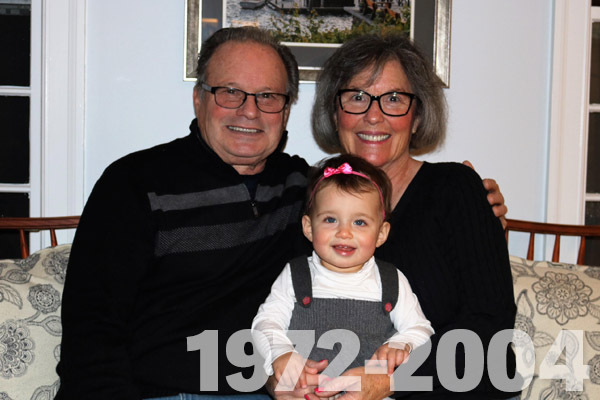 He was a camper at Camp Manitou for boys until he was 16, then returned to Matoaka as a member of the kitchen staff; in 1967, he became a water-ski instructor and worked his way to the head of the department where he stayed for ten years. Mike received a Bachelor of Science Degree in Health and Physical Education from the University of Massachusetts in Amherst, Massachusetts before becoming a full-time member of the Matoaka office staff. Paula met Michael at Camp in 1972. She had been a C.I.T. at Matoaka in 1969 and returned as a horseback riding instructor from 1972 until 1974. Three years later, she took on the role of Head Counselor. Paula has a Bachelor of Science degree in Elementary Education from Boston University. She was employed as an elementary educator in the Newton Public School system from 1975 until 1986. In 2000, Paula retired from teaching Second Grade at the Boca Raton Campus of Pine Crest School and worked full-time for Matoaka. Paula and Michael currently reside in Sudbury, MA. They are always interested in hearing from past Matoaka campers and staff. Paula and Michael’s daughter, Rachel Leigh, spent every summer of her life at Matoaka from 1985 until 2005. As a camper, she spent her first three years in Bunk 8! She was the captain of the Pace Panthers in 2000. 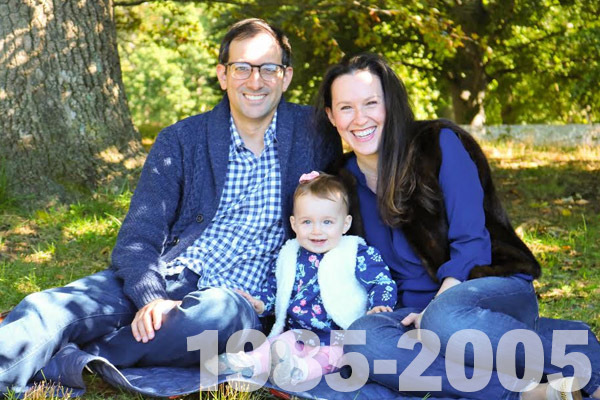 She graduated from Pine Crest School in 2003 and went on to study at Skidmore College in Saratoga Springs, NY where she graduated with a BS in Business in 2007. After graduation, Rachel moved to Manhattan and began a ten year career at the Estee Lauder Companies with the Clinique brand. She worked in Clinique’s Education Department where she was the Manager of Global and North America Events for the brand. Rachel married Drew Stocker in June of 2015. They currently live in Sudbury, MA with their daughter, Madeleine Poppy, who was born in October of 2016. Madeleine is named after her great grandmother and Matoaka founder, Midge Nathanson. Bunk 8 is Great 2023! Susan was a second generation, owner and director at Camp Matoaka. She brought a lifetime of camping expertise to camp for the 47 years she attended camp. As owner and director at Matoaka, she’s had 30 years of office experience and was the resident “homesick” expert, coordinating camp-related issue workshops for staff training, and communicated effectively with camp children to build character and self-esteem. She worked closely with hundreds of girls who spent each summer living, learning and growing up at Matoaka. Susan wrote the “Homesick Manual” which was used as an instructional guide for campers and parents before and during camp. This was considered to be the benchmark of pre-camp planning and training for counselors on this subject. She also created and ran the “Introduction and Co-operative Games” section of our pre-camp staff training to every counselor over the years. These were both innovative and creative, and served as the backbone for creating a caring, sensitive and a highly-trained staff at Matoaka. Most of the parents of campers knew Susan by the numerous phone calls made and received during and after the camp season. Most often, these focused on the many important personal touches involved in running a quality, family-oriented camp. As a camper, Susan loved… Sunday night campfires, picking blueberries and crabapples before and after camp, Buddy Day, playing Speedball for College League and felt truly honored being the Captain of 2 College League teams…Hawaii and Stanford. Also, on her list of favorites was enjoying time with her bunkmates at Landsports, Ski and Tennis. She also liked competing in USLTA tennis tournaments around East Pond and Maine, the batting cages at ‘Rummels’ and ice cream sundaes at the small stand beside ‘Bolducs’. As a counselor, Susan taught Tennis and Smallcrafts and created the Sewing Department, which was first placed in the back of the old rec hall. She played in the counselor/camper softball, volleyball and tennis tournaments. She was the Head of Smallcrafts for 2 summers. Susan graduated from Sargent College, at Boston University, and majored in Therapeutic Recreation. 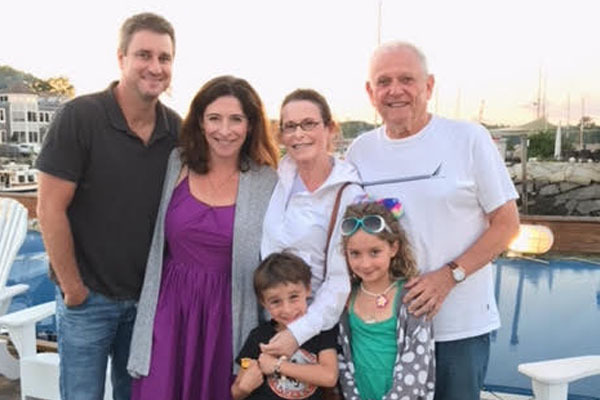 During the winter months, she taught elementary Physical Education in Wilmington and Needham, MA, as well as at The Pine Crest School in Boca Raton, FL. In 1984, Susan became the Director of Dover Extended Day Program in Dover, MA and until recently, she was the After-School Program Administrator of the Fiske Extended Day Program in Lexington, MA. 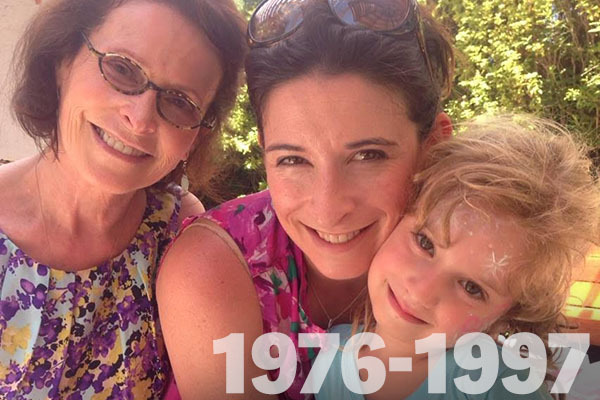 Susan’s daughter, Lara, was born in January 1974. Lara grew up at camp from the time she was six months old and had a nanny for the first four years. At five years old, Lara had a bed in the youngest cabin and was very happy to spend rest hours with her bunkmates and follow them around while they attended some classes. She began sleeping in a cabin at 7 years old. As a camper, Lara enjoyed playing in various sports activities including soccer, tennis, softball and gymnastics. She was Captain of the Dowling Devils when she was in Bunk 15. Lara loved the Friday morning pancakes and whoopie pies! On Friday nights, after services Lara and her Nana (Midge), joined the whole camp as they danced the Hora on the front lawn. Lara loved inviting her bunkmates to Aunt Midge’s cabin to make popovers on rainy afternoons. After Bunk 15, Lara returned to Matoaka as a CIT and then became a counselor, working in the Smallcrafts department and running college league. Eventually, Lara was the Head of the Smallcrafts department. Lara graduated from Ithaca College in 1996. She got a job in the public relations field that moved her out to San Francisco where she worked at both Oracle and then Sun Microsystems. During that time, she met her husband, Ryan McGurk, and they married in September 2005. They had their first daughter, a Matoaka camper, Olivia Joy McGurk on August 23, 2009, and their son, Jack, born on December 18, 2011.